The Tombs of the Queens & Princes - Tomb of Prince Amenkhepeshef. King Rameses III is seen burning incense before a shrine in which stands the God Ptah. Next, the king is introducing his son, the Prince Amenkhepeshef, to another form of Ptah, the Vulcan of the Egyptians. 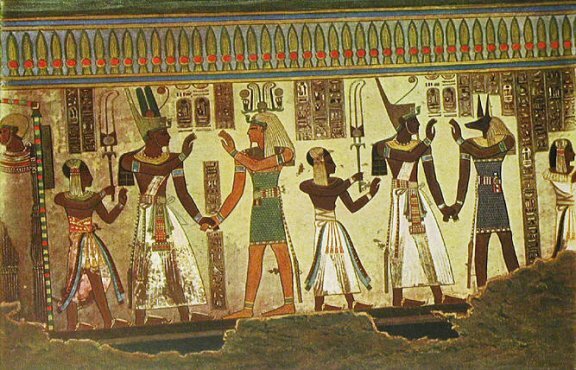 Rameses III is then seen presenting Prince Amenkhepeshef to the jackel-headed Duamutef, who leads them both forward towards the inner chambers of the tomb. At the end of the photograph, Amseth meets them and conducts them forward.